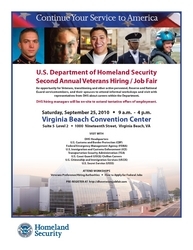 The United States Department of Homeland Security (DHS) will present its Second Annual Veterans Hiring/Job Fair on Saturday, September 25. The event will take place from 9:00 a.m. until 4:00 p.m. in Suite 5 of the Virginia Beach Convention Center. The hiring/job fair will enable Veterans, transitioning and other active personnel, Reserve and National Guard servicemembers, and their spouses to attend informal workshops and visit with representatives from DHS and its major components about careers within the Department. DHS Hiring Managers will be on-site to extend tentative offers of employment nationwide. The United States Department of Homeland Security (DHS) will present its Second Annual Veterans Hiring/Job Fair on Saturday, September 25. The event will take place from 9:00 a.m. until 4:00 p.m. in Suite 5 of the Virginia Beach Convention Center. The hiring/job fair will enable Veterans, transitioning and other active personnel, Reserve and National Guard servicemembers, and their spouses to attend informal workshops and visit with representatives from DHS and its major components about careers within the Department. DHS hiring managers will be on-site to extend tentative offers of employment nationwide. Individuals can register to attend this free event at http://www.dhsveteransjobfair.com. The Department has also invited several non-DHS entities to participate. The workshops will cover two subjects, with each subject presented three times during the day. In the “Veterans Preference/Hiring Authorities” sessions, attendees will learn how to determine their eligibility for Veterans preference, how to claim preference in applying for job vacancies, and how to use the services of special Veteran hiring authorities who are available to Veterans in Federal hiring. In the “How to Apply for Federal Jobs” sessions, attendees will learn how to navigate and apply for Federal positions using the United States Office of Personnel Management website USAJOBS (http://www.usajobs.gov), and they will receive important tips on what documentation Veterans need to provide as well as tips or writing a Federal resume. President’s Executive Order. The White House and DHS are solidly behind efforts to enable Veterans to continue serving the United States by assisting Veterans who seek employment in the Federal government. On November 9, 2009, President Barack Obama introduced a program to transform the Federal government into the model employer of America’s Veterans. His Executive Order on the Employment of Veterans established a Veterans Employment Initiative for the Executive Branch. The Order mandated the establishment of a Veterans Employment Program office within most Federal agencies to help Veterans identify federal employment opportunities, provide feedback to Veterans regarding their employment application status, and otherwise promote Veteran hiring within the Executive Branch. Secretary of Homeland Security Janet Napolitano has set a goal of hiring 50,000 Veterans in the Department by the end of 2012. RecruitMilitary (http://www.recruitmilitary.com), a military-to-civilian recruiting firm based in Cincinnati, will produce the event. Since 2006, the company has produced hiring and informational events for men and women who have military backgrounds. 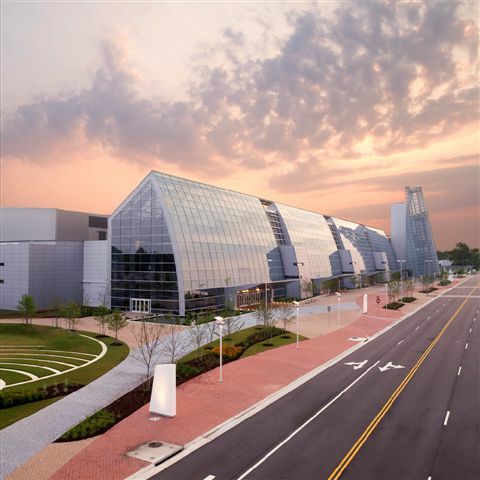 The Virginia Beach Convention Center is located at 1000 – 19th Street, Virginia Beach, Virginia. Individuals who plan to drive to the event can obtain directions at http://www.vbfun.com/conventionCenter/drivingDirections.aspx. For information about careers in DHS, interested individuals can visit http://www.dhs.gov/xabout/careers . PSA for broadcast mediaPublic service announcement for radio and television broadcasts Event announcement ad3 inch square announcement advertises event. Virginia Beach Convention CenterVirginia Beach Convention Center, site of the event.